Following in the footsteps of several Texas schools, the University of Illinois to launch a co-branded retail energy product, in conjunction with Dallas-based Champion Energy. Fans will be able support both the University of Illinois and the Fighting Illini from their homes and businesses; simply by paying their electricity bill. Proceeds from this partnership will support the University of Illinois Division of Intercollegiate Athletics (DIA). "Illinois alumni and fans now have a choice in their electricity and we are pleased to offer them a program that allows them to support the University with something they use every day," said Illinois Director of Athletics, Ron Guenther. "We encourage all Illinois fans to sign up for Fighting Illini Energy, powered by Champion Energy to support the University and the Athletic Department through this innovative concept. We are also pleased that fans will have the option to choose 100% renewable energy as well". Fighting Illini Energy customers will also have an exclusive opportunity to receive game tickets, special offers on Illini gear, access to special promotions and more. "As a proud Illinois alumnus, and for all of us who love the Illini, knowing we can contribute to the University's success simply by choosing Fighting Illini Energy is an exciting proposition," said Branded Retail Energy co-founder Justin Helms. "Fighting Illini Energy is proud to become a new corporate partner of Illinois Athletics and we look forward to increasing our financial commitment to the University as alumni and fans join our program." In addition to letting fans sign-up for Fighting Illini Energy, the company's website will provide exclusive Illini contests and content, fan forums and University news. The University of Illinois at Urbana-Champaign is the state's flagship public university and one of the largest in the nation with nearly 42,000 students. Illinois boasts one of the largest alumni bases in the country. Every business and retail account created through Fighting Illini Energy will result in funds for the University's athletic department, student scholarships and other initiatives. 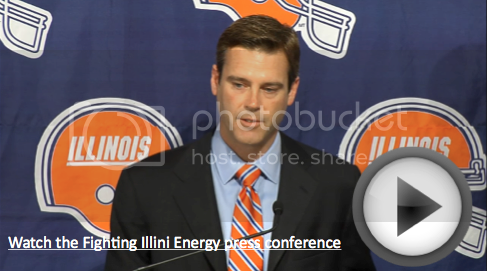 "Fighting Illini Energy is a unique opportunity for loyal alumni and fans to support the University and its Athletics program with something they need and use everyday, and Champion Energy is excited to be part of this innovative electricity program," said Scott Fordham, president and CEO of Champion Energy. "While deregulation is not new to the state of Illinois, many residents haven't made the switch to a new provider, so now is a great time to make that decision and support the school they love, while also saving money on their electricity." Fighting Illini Energy is the official University of Illinois electricity sponsor and will have a significant presence at athletic events. Fans can learn more at FightingIlliniEnergy.com. Branded Retail Energy Company (BRECo) has created similar electricity affinity partnerships with the University of Texas (Texas Longhorns Energy), Texas A&M (Aggie Energy). Texas Longhorns Energy and SMU (Mustangs Energy). BRECo develops concepts, creative, implementation and customer acquisition platforms that focus on sports, cause and educational institutions.